Michael Bloch's long-awaited biography of James Lees-Milne was published by John Murray on 3 September 2009 and may be purchased here . "An admirable biography. Bloch has written Lees-Milne's life in a way that honours its subject: funny, observant and revealing ... the perfect complement to the diaries"
"This book has been eagerly awaited by addicts of James Lees-Milne's diaries, and they will not be disappointed. It is as perfect a biography as it is possible to imagine... It is not merely a rehash of the diaries, but brings to life the mercurial and delicate intelligence that brought them into being..."
"Although Lees-Milne wrote so much about himself, Michael Bloch's admirable biography has nothing déjà vu about it. He has done his old friend proud." The life of JAMES LEES-MILNE (1908-97) spanned the twentieth century; and he left his imprint on that century in a variety of ways. As the first Historic Buildings Secretary (1936-51) of the National Trust, he was instrumental in establishing that institution as the leading force in the conservation of the English country house. Largely through his efforts, such splendid and much-visited properties as Attingham, Charlecote, Knole, Petworth, Sissinghurst, Stourhead, Wallington and West Wycombe came into the National Trust's possession. As a gifted and versatile author, he achieved note first as an architectural historian, later as a novelist and biographer. But he will be best remembered as a diarist who was remarkable for his candour, wit and sharp observation. His later diaries, covering the last twenty-five years of his life, are already recognised as outstanding works of literature and contributions to social history, as has long been the case with his early diaries covering the 1940s. The diaries reveal a fascinating personality, abounding in paradox. He respected tradition, while hating convention; he admired the aristocracy, yet was contemptuous of aristocrats; he combined faint-heartedness with stoical courage; he was bisexual. His complex marriage to Alvilde Chaplin (1909-94) has been compared to that of Harold Nicolson and Vita Sackville-West - a comparison made poignant by the fact that he had a homosexual relationship with Harold in the 1930s, while she had a lesbian affair with Vita in the 1950s. Other friends included some of the most interesting literary figures of his time, such as John Betjeman, Ivy Compton-Burnett, Henry Green, Osbert Lancaster, Rosamond Lehmann, the Mitford sisters, Anthony Powell and Peter Quennell. 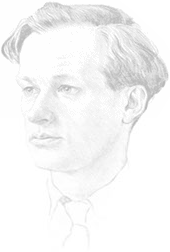 This site has been created by Michael Bloch, James Lees-Milne’s literary executor, who has completed the editing of his diaries and written his biography (see ‘The Bookshop’). He may be contacted at MAB@jamesleesmilne.com. It has been designed by Pascal Mirza.